The Triassic is a geological period that began around 250 million years ago and was followed by the Jurassic period, which began around 200 million years ago. The Triassic is divided into three epochs, the Lower Triassic (250 million years ago to 245 million years ago), the Middle Triassic (245 million years ago to 228 million years ago), and the Upper Triassic (228 million years ago to 200 million years ago). During the Triassic, the Durham area was a semi-dry lakebed between two highlands. Sedimentation from runoff coming from the highlands deposited sand and silt and mud and created alluvial fans at the base of streams coming off the highlands. This deposition accumulated and formed the mudstones, siltstones, and sandstones found in the Northeast Creek watershed basin. 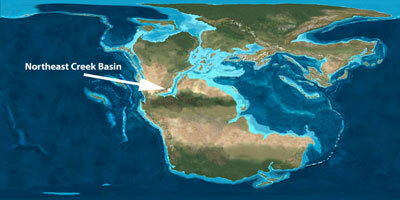 During the Late Triassic, seafloor spreading caused the separation of the North American and African tectonic plates. Vegetation grew in the lakebed; animals fed on the plants and each other. Mudflows captured plants and animals, and over time the remains of these turned into fossils. The following fossils from the Late Triassic were found near Gulf in Chatham County, which is in the Sanford Triassic Basin. These fossils are most likely typical of similar species that might have lived in the Durham Triassic Basin. During the Jurassic period, the stress of sea floor spreading created swarms of cracks into which magma intruded as dikes (vertical) or sills (horizontal). In the Northeast Creek watershed basin, there are numerous diabase dikes. One visible one runs along Northeast Creek from O’Kelly Church Road to Panther Creek. Another runs from Panther Creek to Lake Jordan. One that crossed NC 55 near the Triangle Waste Treatment Plant and T. W. Alexander Drive was blasted and crushed for gravel for I-540. The following map shows the emergence of the North Atlantic mid-oceanic ridge as an intrusion of magma that became basalt (the dark line). 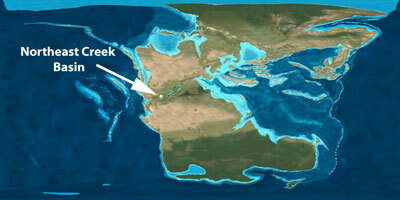 The map also shows the dike swarms in the Piedmont Triassic Basins and the Coastal Plain. The location of the mid-oceanic ridge in relation to modern countries and geographical regions provides a reference between then and now. 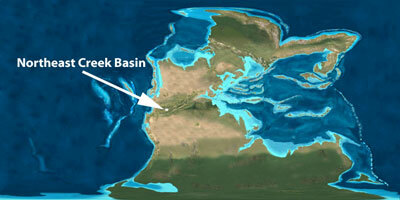 Note that at that time the area that became the Northeast Creek watershed basin was located near the equator.